Are you worried about the AP ECET Syllabus 2019? Here We include all branches wise Syllabus along with Exam Pattern. Download Immediately if you are preparing for the Andhra Pradesh State Engineering Common Entrance Test which was conducted by the Andhra Pradesh State Council of Higher Education (APSCHE) under the JNTUA, Ananthapuramu University. This ECET Test is mainly for the Diploma Holders & the Polytechnic pursued candidates & who are willing to do Bachelors Degree in II year B.E / B.Tech / B.Pharmacy programs Courses. So, Download the get all the Aspirants who want to get the admission in Second Year Lateral Entry Level for the Courses of Engineering ECE, CSE, Civil & Mechanical & EEE Branches they should Download the Syllabus to start the Practice Part. The APSCHE Board announced the Date Of ECET Exam which will be on May 2019 Timings of the ECET Test are 10.00 AM To 01.00 PM. So, you must collect AP ECET Exam Pattern PDF In addition to the Syllabus Pdf format. Visit @ Recruitment_ India.in the main web page. Andhra Pradesh ECET 2019 Syllabus pdf: If the Students are in the practice session in the ECET Examination, they all should download the AP ECET Exam Pattern. The Andhra Pradesh State Engineering Common Entrance Test commonly different for all the Branches. To all the Diploma Holders are eligible for this Test, Here onwards, All you could check out the Subject wise Topics for the Relative Course likely, Engineering Stream, Pharmacy Stream & also the B.SC Mathematics. The total marks of this AP ECET Exam will consist of 200 Marks. In each subject (Maths, Physics & Chemistry) was carrying 50 marks & The Core Subject marks Consist of 100 marks. Mainly In Engineering Sector, The AP ECET Exam Pattern is common for all the branches likely the subjects likely to be Maths, Physics & the Chemistry. So, one should make the Concentrate on this Practice Session by using the AP ECET Syllabus. AP ECET Syllabus for Pharmacy Stream With Exam Pattern In Pdf. Almost the Andhra Board SCHE Board declared the Exam Date of ECET which will be on May 2019. So, in this Peak time, you must be prepared for the Andhra Pradesh State Engineering Common Entrance Test. Based on the Score only candidates get the seat in their dreams colleges. In this Practice Session, you may also get the Old papers for all branches & Streams. So, well preparation AP ECET 2019 Syllabus is compulsory to attend for the ECET Exam. By the way, the Minimum Qualifying marks for ECET Examination is based on the Rank wise. The APECET [FDH & B.Sc (Mathematics)] rank Attained by calculating based on Category wise & the Age relaxation. For the Convenience of the Students, we are giving the Exam pattern for all the branches. Hand out the important Document to make your Practice Session in an easy way. AP ECET Exam Pattern & Syllabus Pdf: Candidates get the Engineering Stream ECET Exam Qualifying marks minimum of scoring in Mathematics, Actually, total 50 Marks In Maths. This subject is common to all branches. & the Physics Subject which is consisting of 25 Marks this also Common to all branches. & the Chemistry Subject the total 25 Marks which is Common to all branches. 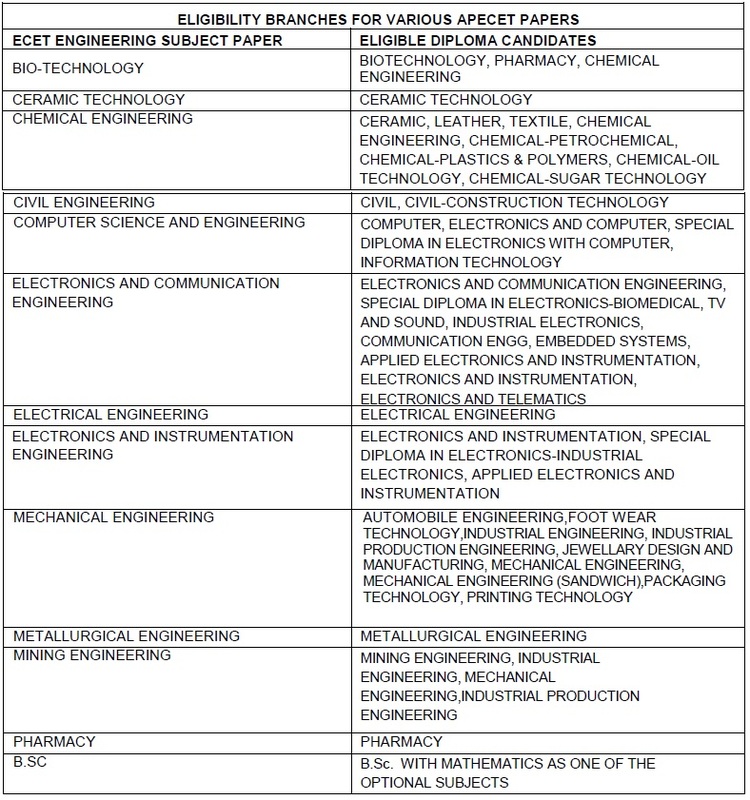 In Engineering Stream different branches are available for the Diploma Holders, They may choose any one of these following branches i.e, Civil /Electrical / Mechanical / Electronics/Communication/Computer/Chemical/Metallurgical/Mining/Electronics & Instrumentation / Ceramic Technology / Bio-Technology In this case, the Exam Attendees have the 100 Marks in total which is Different Question Paper for all branches in Engineering sector. In this paper, the Questions are purely based on the Subject in which branch you would be chosen to get the seat. So, total AP ECET has 200 Marks. & the remaining Streams Andhra ECET Exam Pattern is clearly mentioned on this Web page, Have a look below of the page. For more news of Entrance Exam Notifications check out here, Which are updated on this single page.